"Good hair day? That's so Hair Box #1. 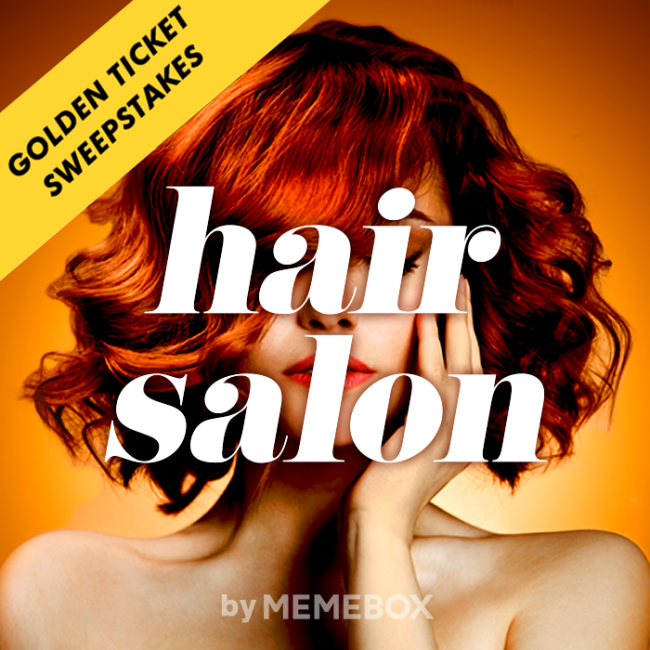 This new Hair Salon box, gives your every hairstyle in your arsenal – from romantic waves and classy blowouts to sophisticated ponytails and more – a mega health-boost for salon-quality hair! We’ve all been there, done that. No matter how much time we spend in the morning perfecting our tresses, inevitable situations (hate you humidity and frizz) your hair has a mind of its own and shows a frustratingly sad ending to our hair-y story. But, arm yourself with this box, and you’ll kiss stubborn frizzies goodbye and say hello to a world of healthy locks, stunning shine, and mega pro-quality hair care! Load up on this box, and you’ll have everyone asking where you get our hair care done! " I bought this box before this contest came out, but luckily it applied to prepurchases too. The majority of people, including myself only received a $3 off coupon. 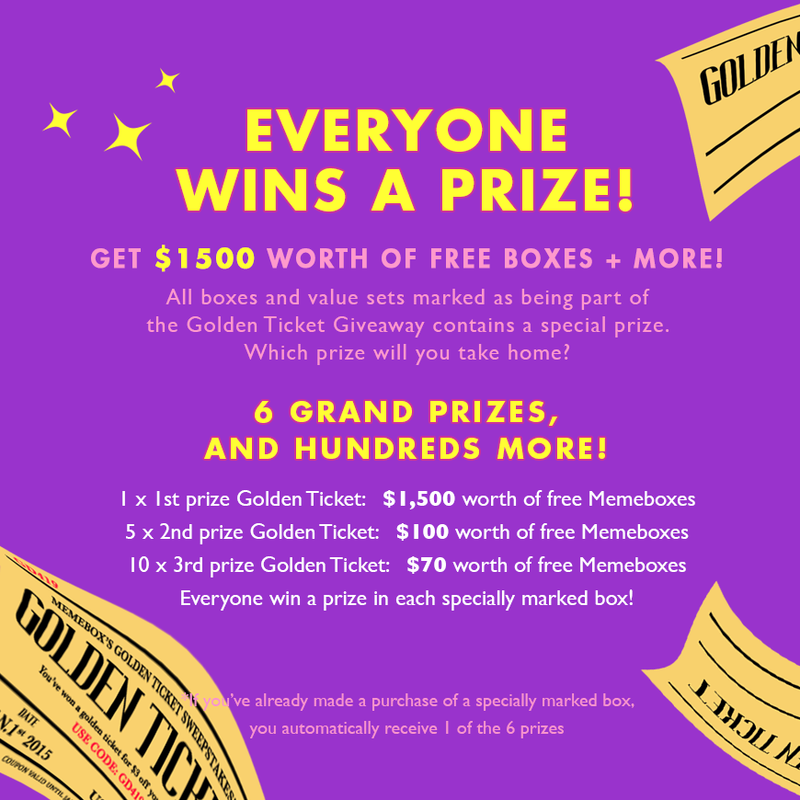 If you were one of the lucky ones to win a grand prize, I'd love to hear from you! Memebox Product Description: "A highly concentrated hair ampoule awarded 1st place in the Hair Ampoule beauty category. Its rich formula is enriched with top hair renewing nutrients - protein, silk amino acid, keratin, collagen, and ceramide. Replenish abundant moisture and healthy shine to dry, damaged hair with hair salon quality care!" How to Use: "Mix it with water in 1:1 ratio and blend well until it turns into a cream-type. Thoroughly massage the mixture into hair and rinse off after 20 minutes." Memebox Product Description: "A non-rinse type shampoo designed to target those on-the-go. The blend of menthol and 15 kinds of naturally derived ingredients refresh and deliver rich vitamin nutrients to hair and scalp tired from long hours spend outdoors. The foamy formula absorbs easily into hair with a refreshing menthol after-feeling and without the need to wash it off with water." How to Use: "Pump out 3-5 times onto hands and massage it into hair until the foamy bubbles are completely absorbed. Softly towel-dry." This is basically a dry shampoo..a type of product that I've yet to try. Given my lack of time these days, I should give these a try between washes. Memebox Product Description: "Na.8's Outbath Treatment is a yuzu citron-scented leave-on hair treatment. It deep conditions hair and delivers an optimal blend of transformative hair nutrients to restore and replenish damaged hair to a shiny, healthy state. Best for busy girls on-the-go, this miraculous hair treatment restores the protective layer on dry or damaged hair and reduces hair's porosity for strong, lustrous strands." How to Use: "Apply the treatment to dry, damaged locks and do not rinse of with water. Let the nutrients absorb into the hair." Memebox Product Description: "This is an intensive hair care oil for dry and damaged hair. It contains baobab oil extracts fortified with avocado oil which works not only to protect hair from external stress - UV and heat - but also to deeply nourish and replenish. The gentle formula is also enriched with vitamin E, vitamin A, omega 6, omega 9, and chlorophyll, all widely acknowledged ingredients for restoring aging skin and hair." How to Use: "Take a small amount of the oil onto hands and massage it evenly through towel-dried hair." Memebox Product Description: "Solucion 9 is a scalp & hair specializing cosmetics brand using only natural herbal ingredients. This Aztec Therapy Shampoo gets its inspiration from the beauty secrets of Ancient Aztecs - known to have incorporated herbal and medicinal plant extracts in anti-hair loss treatments for their females. A blend of 9 natural herbs-espinosilla, jojoba oil, nettle, oritiguilla, aloe vera, rosemary, chamomile, and citrus - works to soften and strengthen damged hair, and deliver a refreshing aroma therapeutic effect." How to Use: "Later the shampoo and massage into scalp and hair. Leave it on for at least 5 minutes before rinsing." Memebox Product Description: "Infused with biota seed, coix seed, green tea and gold extracts, this hair treatment will not only prevent hair loss but also re-energize and strengthen thin, damaged hair. Its excellent cooling formula will gently soothe and nourish your scalp at the same time." How to Use: "Apply generously over wet hair and massage the scalp with your finger tips. Rinse off with lukewarm water after 2-3 minutes." Even though I didn't win the grand prize (wishful thinking), I'm quite happy I bought this box. I'm building up quite a collection of hair products now. If I can let go of my hoarding tendencies, I might be able to try more of these products sooner. Memebox Superbox 69 Banila Co.